Experts in home improvements in Brisbane, Sunshine Coast, Gympie and surrounding areas. 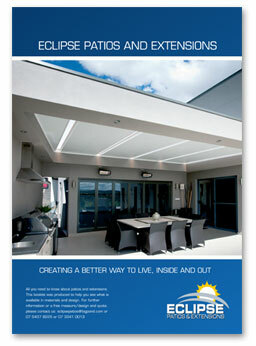 Eclipse Patios and Extensions are a completely independent building company with no alliances to any manufacturer. Unlike distributers and franchisees with exorbitant fees associated with them, we offer the best solution for you. We are not limited to a particular product thereby allowing you real choices. We believe that you, our clients, are better served with installations fully suited to your home, lifestyle and location; all important factors when deciding on your new addition. We at Eclipse are committed to offering you real value for money and complete peace of mind for every one of our customers. Our focus is to create a dream lifestyle for you, so you become the envy of your family and friends, our next customers. For over 40 years Eclipse Patios and Extensions’ management and staff have been designing and building Patios, Extensions, Additions, Timber Decking, Enclosures and Carports. We discovered very early on that it takes more than one or two attributes to make it in this industry. We realised that we had to excel at every part of what we do; this philosophy has got us to where we are today. Our customers want the best when it comes to their home and their family’s lifestyle. Eclipse will come to you free of charge and design your next extension around you and your family’s wishes. Our fully experienced building consultants will come up with a plan that you will be proud to show off to your friends, something that is not only functional and looks great but also adds value to your home. Eclipse will engineer the design to exceed normal safety standards; we believe a little extra support doesn’t cost much more but the benefits are enormous. We – like you – want to sleep well knowing that our buildings will withstand the harshest of storms and most have been cyclone tested. 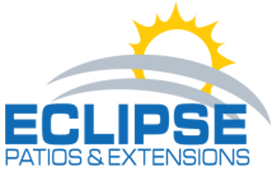 Eclipse offer a 15 year construction guarantee which is double that of most of our competitors. Eclipse materials come with guarantees/warranties from manufacturers that have been in the industry for as long as we have, GIVING YOU PEACE OF MIND for your entertainment area. No job too big or small. We have been involved in large projects with commercial companies and also very small covers for units. Every job is important to us. Call Steve and the guys for a free design and quote today.